It’s inevitable -- whenever a famous person dies there’re always questions about what legacy he or she leaves behind. For most “ordinary” folks the answer isn’t complicated; you simply look to his or her career and family for clues as to how they’ll be remembered. Did he make a positive impact? Was she a leader in the community? Were they good people? Simple thoughts, basic retorts. Not so for the late Sen. John McCain. The longtime Arizona lawmaker and 2008 Republican presidential nominee’s expected passing last Saturday unleashed a whole range of emotions from just about every segment of the ideological spectrum. Nearly everyone appropriately praised McCain as a man who honorably served his country in wartime and then lived a dedicated if uneven existence as a politician. Just as it was in life McCain’s death engendered a heap of controversy over the lasting meaning of his friendships and liaisons with Democrats and his numerous calls for everyone to “work together” regardless of the circumstances. The accolades came first. Michael Burke reported at The Hill, “Sen. John McCain’s (R-Ariz.) death reverberated across Washington and the U.S. as current and former lawmakers on both sides of the aisle praised the longtime senator’s character and decades-long political career on the Sunday news shows circuit. Assuming his soul went “up” (not down), McCain must have been smiling from heaven upon witnessing all of his former pals and rivals alike mouthing such pleasantries. If they’d only been so cooperative and sweet when the cameras weren’t rolling and the man’s heart was still beating! Like many of them McCain wasn’t appreciated for his ability to spare his sharp tongue when the occasion called for it. Maybe Democrats should pretend all Republicans are dead and start saying nice things about them while they still walk the earth. But there’s also the sense Democrats heartily believed their tributes to McCain because he was a Republican who seemingly took delight in publicly mauling his intra-party rivals and opponents. McCain’s well-earned “maverick” nickname didn’t come from nothing, after all. According to the dictionary, a “maverick” is one, an unbranded range animal; especially a motherless calf, or, two, an independent individual who does not go along with a group or party. Ah yes, there’s the “independent” word. One could speculate the Founding Fathers had someone like McCain in mind when they envisioned a principled American legislator who would ignore the perils of faction to vote his conscience at all times and consider the best interests of his constituents in order to advance the common good. If American politics had actually evolved this way maybe McCain would’ve fit the bill. Instead he passes down a legacy of regularly stabbing his compatriots in the back and leaving fellow party members like Vice President Mike Pence hanging when he suddenly and with little warning switched his vote (as he did with Obamacare repeal last fall) on something important. Democrats loved McCain not so much for his “independence” as his willingness to be the axman turncoat stealthily imbedded and dwelling among their political enemies. Think about it – is there a single Democrat today in either house of Congress who is comparable to McCain? It used to be McCain’s good friend Sen. Joseph Lieberman was willing to supply an occasional vote in favor of American military interventionism but there aren’t any Democrats today who’ve shown shades of defying party leadership like McCain and Lieberman did regularly. Let’s not forget – Lieberman was all-but kicked out of the Democrat party for his support of George W. Bush’s Iraq War, necessitating a run as an “independent” to win his final term. Despite his success within the GOP McCain was not well-loved by most fellow Republicans – and certainly not by the grassroots. McCain followed a typical pattern every six years (and during his runs for president). He would talk like a conservative, pledge to get tough on illegal immigration and then, when safely returned to the senate, revert back to his old “maverick” self and begin savaging his own kind whenever they disagreed with him. Rumors circulated several times McCain was considering leaving the GOP to become a Democrat too. Thanks to a sophisticated truth-bending marketing onslaught to hoodwink the public the Gang’s compromise bill passed the senate -- but ran into conservative opposition and died a painful death in the House. McCain also earned charter membership in the “Gang of Fourteen” that united in 2005 to push through a few of George W. Bush’s judicial confirmations. It was a completely unnecessary sellout from the Republican standpoint since the party was still in the majority and most nominations should have been uncontroversial. Just last year (a few months before he was forced to leave DC for good due to his brain cancer) McCain tried to assemble another compromise “gang” to gain bipartisan approval for Trump Supreme Court nominee Neil Gorsuch. The idea never got off the ground, however, because he couldn’t find any Democrats who would confirm Gorsuch and turn on their leaders – so McCain’s “gang” building days were over. Many of McCain’s most noteworthy apostacies defied party leadership, which in the abstract is a good thing. When Sen. Ted Cruz or Sen. Rand Paul defy Mitch McConnell, for example, it’s in furtherance of conservative limited government principles and keeping their promises to voters. When McCain went off on his own more often than not it was to broker some political compromise pushing legislation that pleased no one and would accomplish nothing. Couldn’t it be said such a person does more harm than good? It wouldn’t be a stretch of logic to suggest if there were 100 McCains in the senate that plenty would get done but conditions in the government would be even worse -- and Congress’s approval rating even lower than it is now. Bipartisan cooperation sounds nice in the abstract but when your opponent demands something completely unreasonable, taking and eating “half a loaf” would only make you sicker. Democrats think we need more McCains. No one else does. In fact, two of McCain’s #NeverTrump friends (Senators Jeff Flake and Bob Corker) are skedaddling out of the senate because they couldn’t hope to win primary elections this year. If Republican voters wake up at some point the days of “mavericks” like McCain might be numbered. McCain will be buried at the Naval Academy on September 2. Speculation is rampant on who Arizona Gov. Doug Ducey will appoint to succeed McCain (until 2020, when a special election will be held to fill the final two years of McCain’s term). Reid Wilson wrote at The Hill, “Now it falls to Ducey to choose McCain's successor. The first-term governor has already begun considering a list of potential replacements, according to four Republicans either familiar with Ducey's thinking or close to those who have been involved in initial discussions. Not knowing much about any of the top candidates it seems clear the Grand Canyon State’s internal political situation will weigh heavily on whomever Ducey chooses. According to Wilson’s article, Ducey is keenly aware that the grassroots (a.k.a. Trump backers) wants a conservative Trump supporter tabbed to replace McCain. Getting it right is crucial for Ducey since he’s on the ballot in two months and doesn’t want to risk infuriating his own base. Needless to say Arizona conservatives weren’t wild about sending McCain back to Washington again and no doubt many held their nose as they voted for him despite his open antipathy to the GOP presidential nominee (whom he said he wouldn’t vote for). McCain was seen as little better than a Democrat – good thing today’s Democrats are all so heinous…or he might have lost. According to Wilson one name that’s apparently no longer in consideration is McCain’s widow Cindy. It goes without saying if Ducey appointed Cindy out of some sort of emotional bow to John’s memory that he’d face a backlash in November. Dynasties aren’t popular these days. One way to avoid the wrath of the voters would be to appoint Dr. Kelli Ward, the conservative second place finisher in yesterday’s Arizona GOP primary (she split votes with Sheriff Joe Arpaio and lost to establishment McCain-like honk Martha McSally). In another so-called “year of the woman” it would only make sense to send a real conservative female to Washington. One note --- Ward is supposedly out of consideration already because she was seen as openly campaigning to replace McCain when he passed. We’ll find out what Ducey decides in a few days. President Trump tweeted out an appropriate condolence on Saturday but reportedly was unwilling to go further in praising McCain. Who can blame him? McCain said he didn’t even want Trump at his funeral. Emily Birnbaum reported at The Hill, “President Trump rejected a White House statement praising Sen. John McCain (R-Ariz.) following his death on Saturday, according to a Washington Post report. “Trump reportedly told his aides that he preferred to tweet his condolence, and tweeted out a pared-down statement in which he did not offer praise of the Arizona Republican. McCain’s final selfish act was refusing to resign even when it was clear from a medical standpoint he wouldn’t recover. McCain’s supporters would probably argue his recalcitrance was due to a patriotic desire to serve up until the end; realists come closer to the true reason: it was his last very public defiance of President Trump. McCain was willing to take all his “friends” (Republicans) down with him as he could no longer vote. Great guy, right? 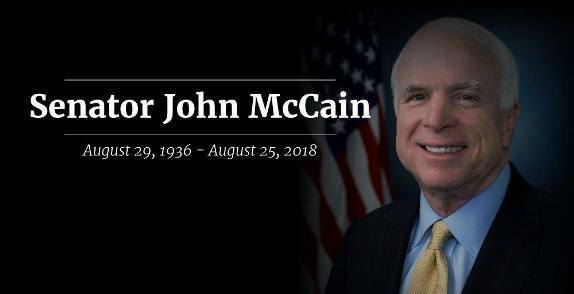 John McCain is gone. With him went one of American politics’ most unique and controversial political figures. If it was McCain’s goal to have historians poring over his life for decades to come, he’ll certainly get his way. As for conservatives, we hope he’s the last of his kind. Submitted by email_registrat... on Wed, 08/29/2018 - 11:50. It was easy for me. I lost my dad in the '90s so my heart went out to the family. To John McCain himself? Most who have been in Viet Nam know songbird as a traitor to his country. Giving out coordinates, perhaps even the ones his of uncle's ships. While he was in a bed. I won't make light of his injuries, but you simply don't do that. His purple heart I understand and think is right. Other medals? If his relatives weren't admirals he wouldn't have gotten them. Now let's go to about the '80d, remember the Gang Of Eight? A nice scam they were running. Again against the people of the US. His latest one, screwing everyone out of the skinny repeal and replace. I admit, we didn't lose so much there and President Trump did get rid of the single payer (worst part) mandate. What I hated was his turning to Schumer and saying, "Let's see Donald make America great now." I guess he'll be with Hanoi Jane for eternity. I still wish his family the best.